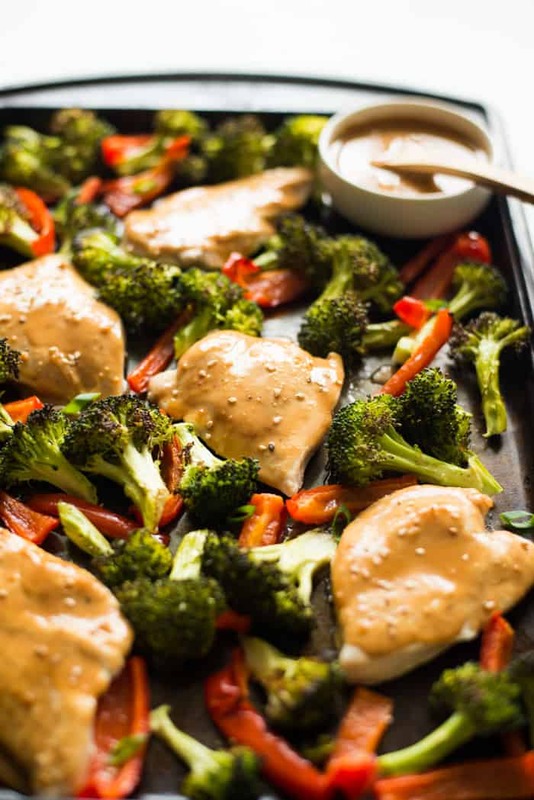 This simple chicken sheet pan dinner is an easy peasy meal that takes less than 30 minutes to make. 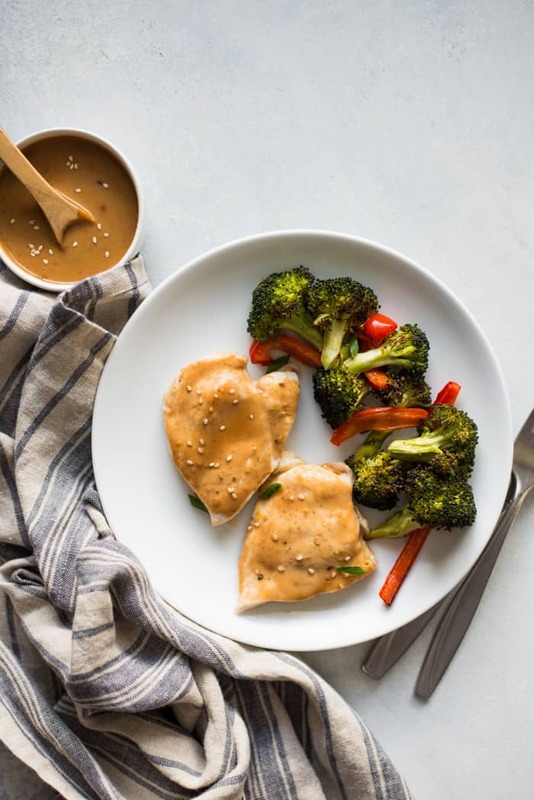 It’s paired with roasted broccoli and vegetables and top with a mouth-watering peanut sauce. The sauce keeps well for up to a week, so you can enjoy it with other meals! Now that the weather has gotten noticeably chillier here in Sacramento, I find myself looking for excuses to turn on the oven: to make roast dinners, roast a bulb of garlic or even to toast bread. It is so cold around the house, and I’m finding that my San-Franciscan-mild-weather-lover sensibilities are betraying me. I am not made for cold weather. 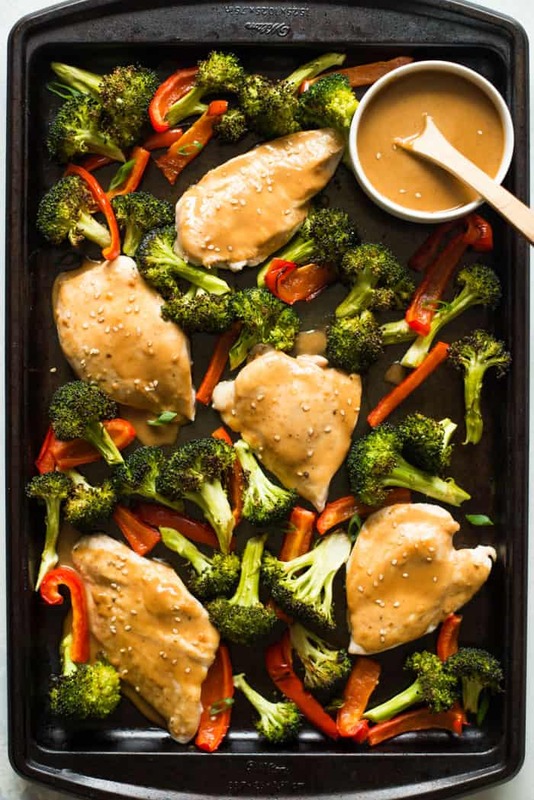 Sheet pan dinners, like this chicken and vegetable deal here, have definitely become a mainstay. There’s something about roasted meat and vegetables around this type of the year that gives me a sense of comfort, warmth and satisfaction. I’m sharing this recipe over at my friend Lindsay’s blog, The Lean Green Bean, today. Go check it out! Speaking of sheet pan dinners, I just taught a meal planning class yesterday at the library! The class was structured quite differently from my usual routine. Less cooking, more talking. I discussed my thought process when I create meal plans and talked about the importance of weekend meal prep. I must admit, I was worried that all of this wouldn’t work, that the attendees would find my constant talking to be a bit too much. I was pleasantly surprised that everyone enjoyed the program! So many people came up to me after class to let me know how much they learned about meal prepping, and to be honest, that’s all I ask for. Today, I’m sharing another one of my quick weeknight favorites over at Lindsay’s blog. She just gave birth to a cute baby girl, and I’m helping her out by sharing one of my recipes there. For the full recipe of this roasted chicken sheet pan dinner, check out my guest post at The Lean Green Bean and share the love!